Note: If your dog is displaying signs of aggression around food or toys, I recommend you contact a trusted trainer in your area. 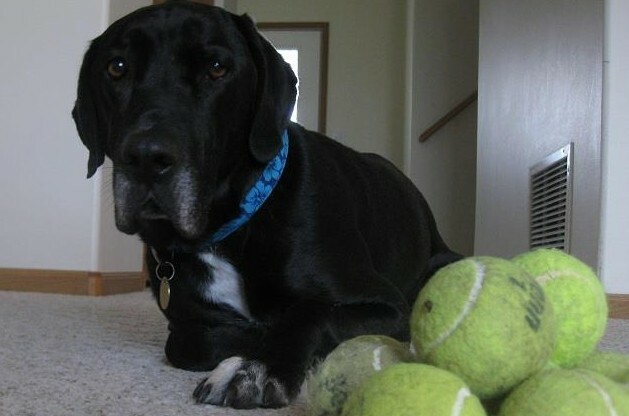 Dr. Patricia McConnell had a great post on her blog “The Other End of the Leash” last week about how to deal with a dog’s possessiveness using desensitization and classical conditioning. It’s worth reading if you have a dog with possessive aggression of food, toys, space or whatever it might be. Instead of teaching the dog “drop” or “leave it,” (which I highly recommend you still do), you are conditioning the dog’s response to someone approaching the object of value. The basic idea McConnell describes is to find something your dog likes even more than the object she guards. So, maybe your dog guards rawhides, but she likes pieces of hot dogs even more. What you would do is set up a scenario where the dog is likely to guard a rawhide. With your hot dog bits in hand, you would then walk up to your dog but stop well before she starts to guard the rawhide. Toss her a piece of hotdog and walk away. You want the dog to think, “No! Don’t walk away!” McConnell wrote. Then, very gradually, you decrease the distance over several short sessions over several days until your dog is OK with you approaching her while she has a rawhide. Then you also need to condition the dog’s response to someone reaching for the object. You would do this by bending down near the dog, dropping a hot dog bit and standing back up. Eventually, you will move your hand closer and closer until you can safely remove the object and give the dog something even better in return. You are not training your dog to respond to a cue, McConnell wrote. You are conditioning an internal response to someone approaching something the dog cherishes. This is certainly not the only way to deal with a dog’s resource guarding, but I like the approach and thought many others would find it helpful. How do you deal with resource guarding? That’s what we did! Once Jasper’s trust had been built enough from throwing bits of food, we would also walk past him and pay him no attention as he ate his bone, showing him that just because we were near him didn’t mean we were going to steal his bone. Then once that trust was built up enough, we’d approach him with the treat and pat him while we treated him, and we ignored the bone. In less severe resource guarding situations (Jasper loves his toy fish and won’t come near you if he thinks you’ll take it off him) we’d do the ignoring thing, or as we got near and he made a move to get away, I’d say “I don’t want it,” while moving away. Now, Jasper knows the difference between us purposely chasing him with the fish as a game and us just walking past while he’s got his fish, because we say “I don’t want it” as we pass. We can now also use the “I don’t want it” with the bone too. Interesting. I like what you did by using “I don’t want it.” Great work! I can see how that could work. Fortunately, it has been some time since I’ve had to deal with a dog in resource guarding. Maya will get up and walk away if she things you want what she has. And Pierson will hold on to his toy or whatever he is guarding, but he won’t growl or snap. And he will let go when I tell him. I recently adopted a 3yr old Siberian Husky. Every time the other tenants let their golden retriever out, my dog Nala guards our pirch and the golden retrievers wstering bowl. She does not let her go peeor drink water. When I lock her inside the house she howls nonstop and I get scared bbecause she shows body language like she’s going to attack. So I lock myself in the bedroom. Any suggestions on how to stop her from guarding the other dogs watering bowl? Could you keep her on a leash for now to prevent the behavior? I would probably hire a trainer to come offer some suggestions. I don’t like how you have to lock yourself in the bedroom. I don’t want you to get hurt! I hope it makes a difference too! Unfortunately, a lot of dogs do try to guard their bones/food. We are losing our minds over this food bowl guarding. I can take anything from our Golden, put my fingers in his mouth if he has a stick or stone. But the minute the food bowl goes on the floor if you come near him he growls and even snaps. We have tried feeding by hand, putting great goodies in his bowl, giving him kibble and then another treat, some in the bowl some not. I have him where he isn’t bothered by me but now he is growling at my son when he tries somewhat the same technique. My husband thinks being physical with him and showing him he is boss works best. I don’t agree, it just causes us stress and makes everyone unhappy including the puppy. Help!!!!!! Does that make sense? It takes a lot of time in short sessions over a few weeks and each family member will have to practice. I need help!! I’ve had Gator, a boxer mix for about 4 years now. My hubby does most of the walking in the afternoon. Gator LOVES eating squirrel, raccoon, possum poop. My hubby (trying to avoid him from a stomach ache since he has severe allergies) tries to retrieve it from his mouth. While Gator lets him, yesterday he bit my hubby. And it wasn’t just a flesh wound. I know a lot about dogs behavior and training. I always tell my hubby, once he picks it up, leave him be. You can’t let him learn from his mistakes if you take it from him. If he eats it, he gets a stomach ache. Consequences of his actions. My hubby has taken this very seriously and now wants to get rid of him! I was raised when you adopt a pet, it’s a lifetime commitment. I keep telling my hubby to stop taking it personal, he suffers from possessiveness. We already have the training techniques you’ve mentioned. Also, as a ‘punishment’ he was ordered to sleep in his cage and not the bed last night. I just know that if you give a dog away, you strip them of their security: emotionally and mentally and it can forever scar a dog! You can severely break their psyche and they can lean more toward aggression leading to them being euthanized. I love Gator and he’s a good boy but this is a problem since just recently when he’s on the bed, if we go to move him or I put a blanket on him, he’ll growl. He’s not an aggressive dog and he’s only 5 so I don’t understand where the aggression is coming from. We’ve had him trained and overall he’s a really good boy. What should I do? Thank you so very much for any advice or opinions!! It’s needed! Sorry to hear this and sorry to hear your husband was injured. I would not let Gator sleep on the bed at all if he’s growling at you. That’s just my opinion, but no way would I allow a dog to growl at me on my own bed. Once a dog growls at me on the bed he has lost all furniture privileges for quite some time. For the poop eating and the possessiveness associated with it … yes that is challenging. Does he get possessive of food or toys or treats in any other scenario? I’m wondering if you could just keep him leashed on walks and prevent him from grabbing the poop for now. Does he know “leave it”? Perhaps bring along something even more tasty to him and reward him for “leave it” but it would have to be something like real steak, cream cheese, chicken liver, something he finds more interesting. About re-homing him, I’m sorry you are faced with that decision but it really is up to you and your husband. I can see both sides, but I will say I know so many dogs that adapt just fine when they are re-homed. They move on quickly and do very well in their new homes. So don’t hold onto him simply for fear of him being scarred emotionally. Keep him if you and your husband are in agreement to continue your commitment to the dog and can continue to offer him the life he deserves. I have 3 dogs and even though they are not showing signs of aggression. Two of them are very possessive of balls when we throw them in fields. to the point they run off with them and try to chew them to bits. I can eventually get them to leave them with treats (the dry kind) but it is tiring as it takes a while and spoils the fun . He plays with the other dogs and life is great until one of them walks by his chair or blanket. I have two 6 month old huskies we got them at the same time and they are from the same liter. They are starting to get possessive when we give them new toys. It is really becoming a concern. i hope this helps any other tips? 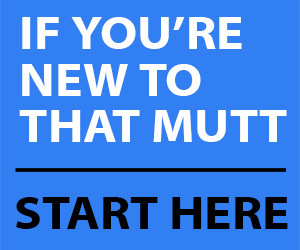 CHECK HERE and get That Mutt's Training Tips Delivered to your Inbox! Lindsay Stordahl (with her mutt Ace) is the blogger behind That Mutt. Julia Thomson (with her mutt Baxter) writes regularly for That Mutt. Barbara Rivers writes for That Mutt about raw dog food. Lindsay Stordahl is a partner of MightyPaw.com, a dog product company. She is also a participant in Amazon’s affiliate advertising program.